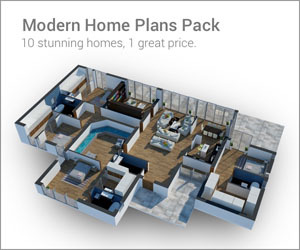 Octopus home décor is not the first thing that comes to mind when designing your interior. Hard to find and eclipsed by stag and owl accessories, our tentacled-friends often lose their place. 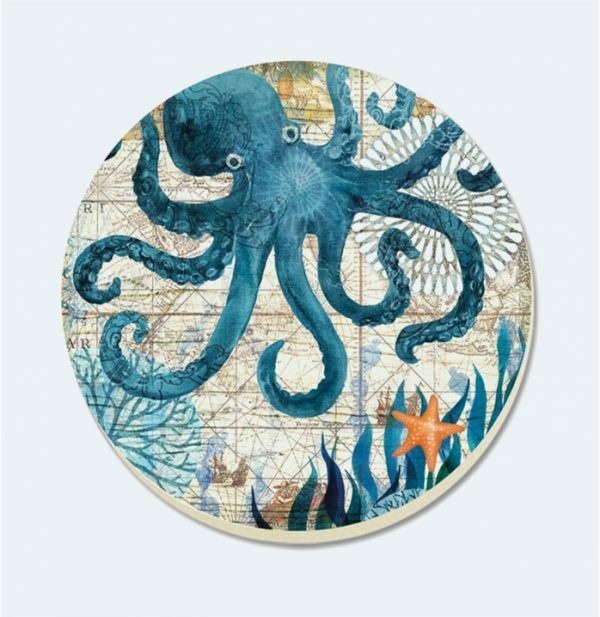 Find the fun in eight more sets of hands with these octopi accessories and home décor finds, for the sea lovers amongst us. Perfect for a coastal-themed or holiday home, they sit perfectly in a bathroom – but also in a range of office, home, dining room and even lighting situations. Metal or plastic, they add a kooky but friendly face to any space, and a great source of pleasure for kids and adults alike. Look at our list to see if a certain octopi suits you. 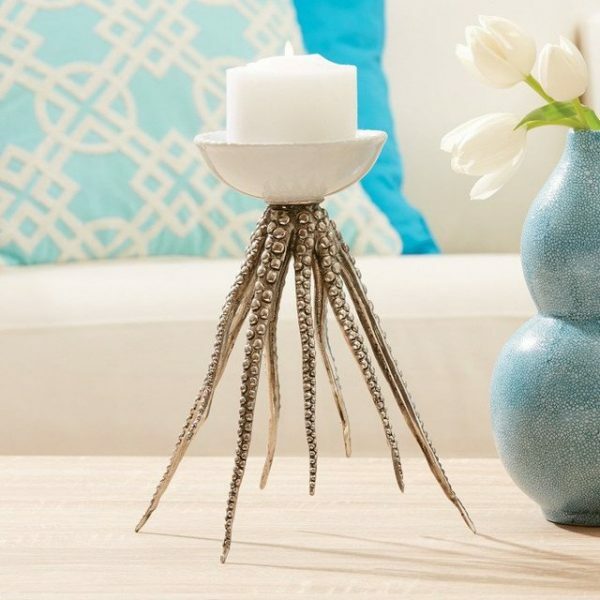 Octopus Candle Holder: Get the party started with this metal octopus candle holder, resplendent with five candle spaces. Quirky and spontaneous, it can set the scene for any family occasion. 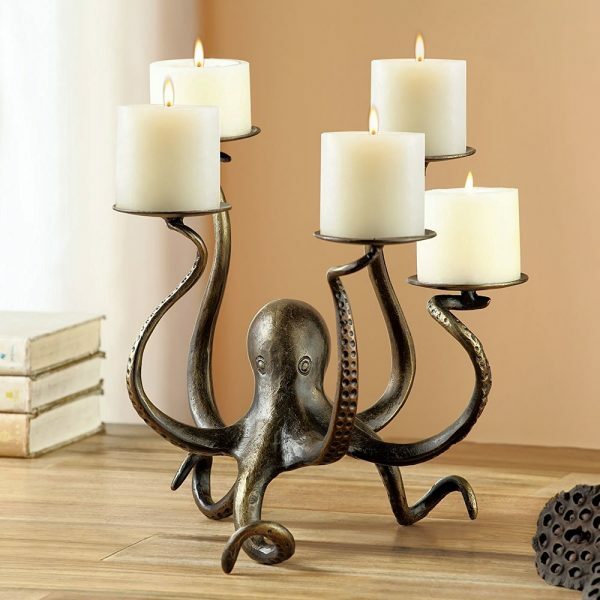 Steampunk Style Octopus Candle Holder: Who knew octopi could be edgy? With this four-thronged candlestick design, your dinner-table guests are in for surprise after surprise. 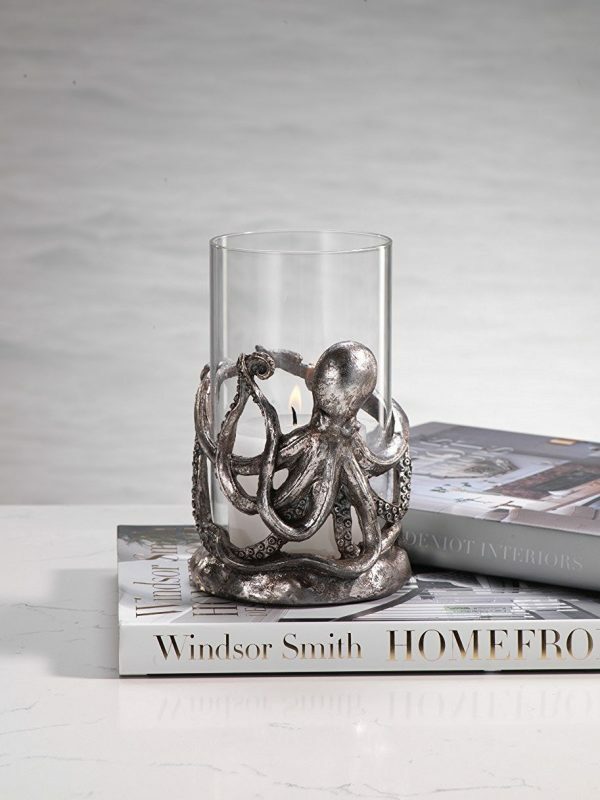 Silver-Plated Octopus Pillar Candleholder: For those wanting their octopi with a side of class, this silver-plated candleholder offers the best of both worlds. 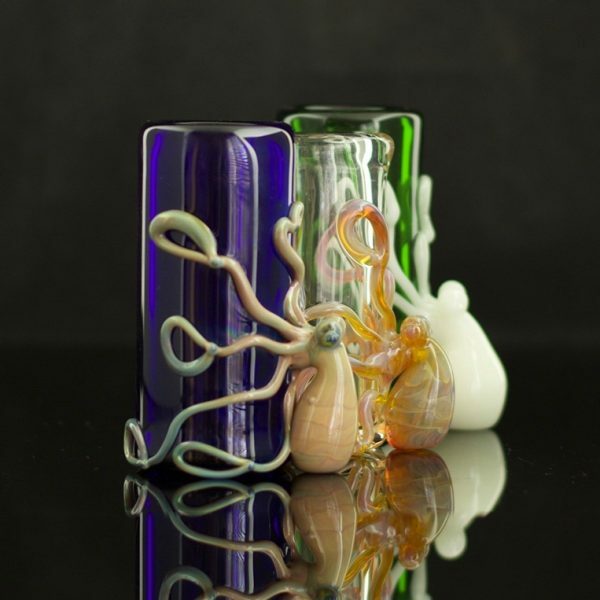 Lightly hinting with a tentacled design, it would work well as a bedside fixture or lounge table feature. 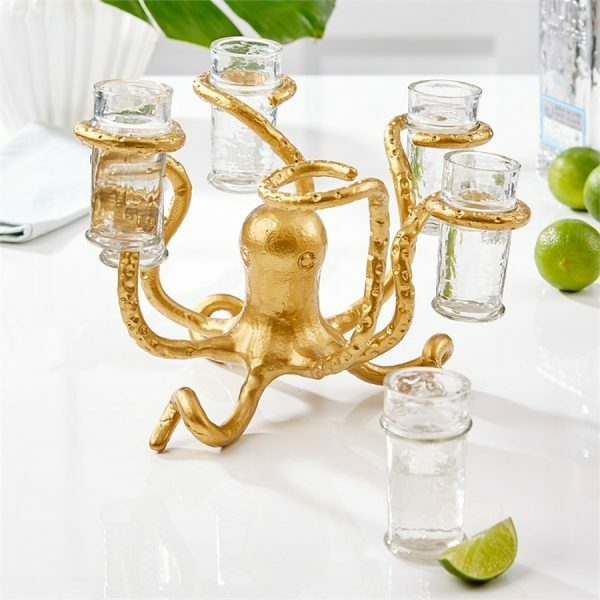 Octopus Glass Candle Holder: Prefer your candles more sheltered from the wind? This silver-look octopus lets flames wither slowly in the dusk. 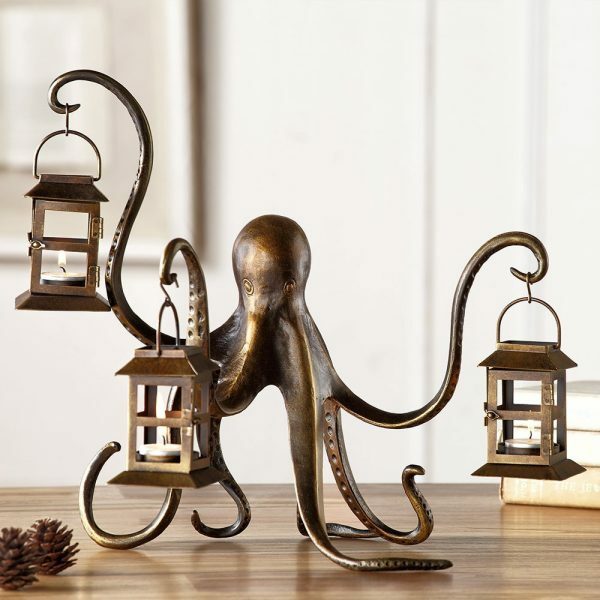 Octopus Lantern: For a more Mediaeval look, why not try an octopus lantern? Lightly bronzed and perfect for Halloween, it’s a conversation starter for any dinner table or entranceway. 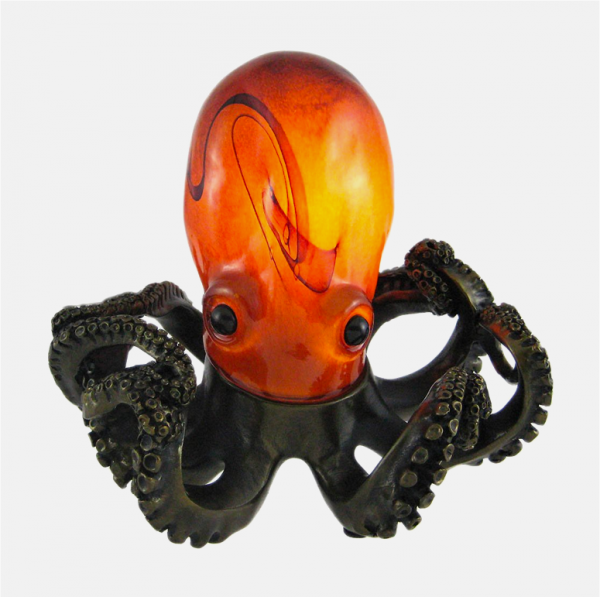 Octopus Amber Accent Lamp: We all love a bit of colour in our lives, and this lamp is no exception. 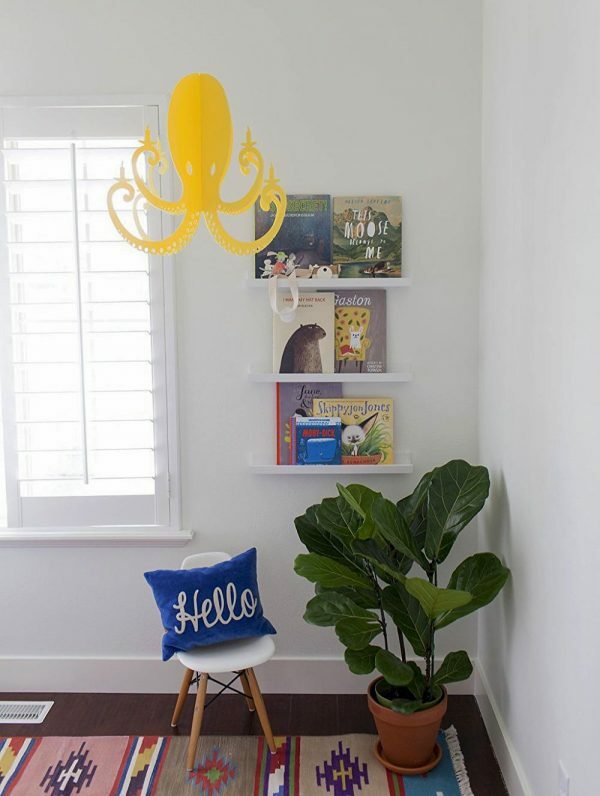 Resplendent with an amber-hued head light, could it be a favourite for your kids’ room? 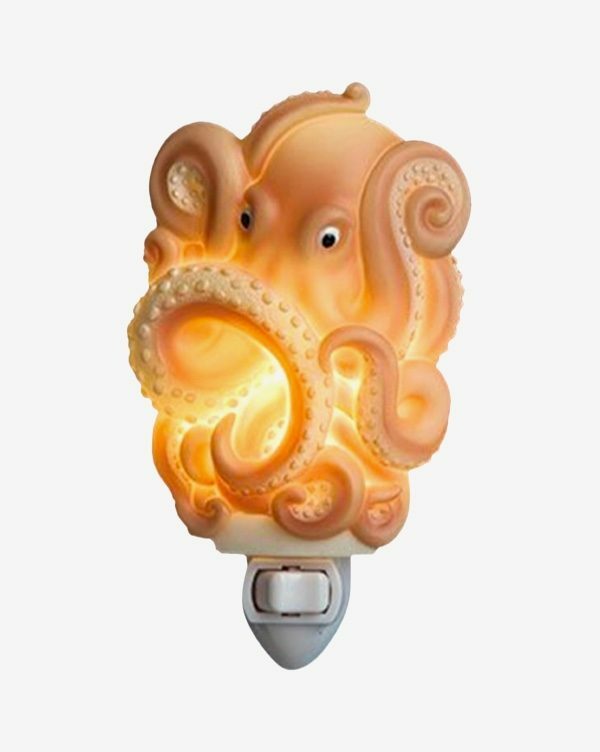 Octopus Night Light: A definite favourite for children, the night light is a must for dreamtime. Make night-time sea-time with this natural-coloured night light, easily plugged into wall sockets. 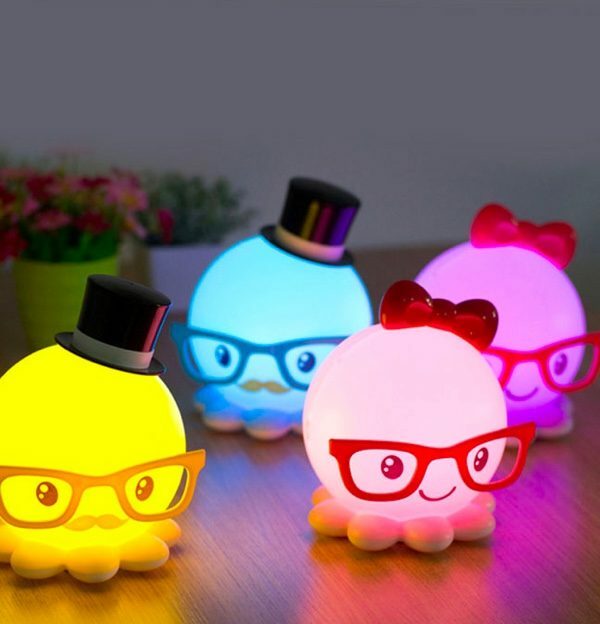 Cute Octopus Night Lights: For a night light you’ll be jealous of, you can’t go past these mini octopi. Full of character with top hats, bows and glasses, choose from one of four colours for a cuter night’s sleep. 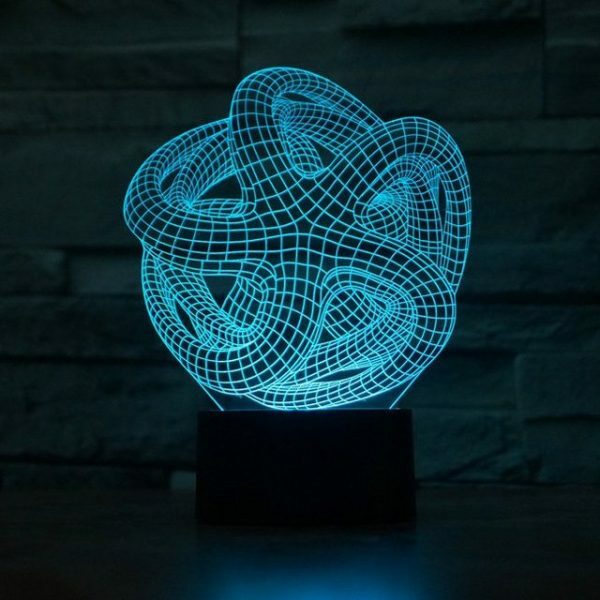 Octopus 3D Illusion Night Light: For a night light that doesn’t look like a night light, look to this 3D creation. Flat on the wall, it’s multi-dimensional illusion is more art than children’s accessory. 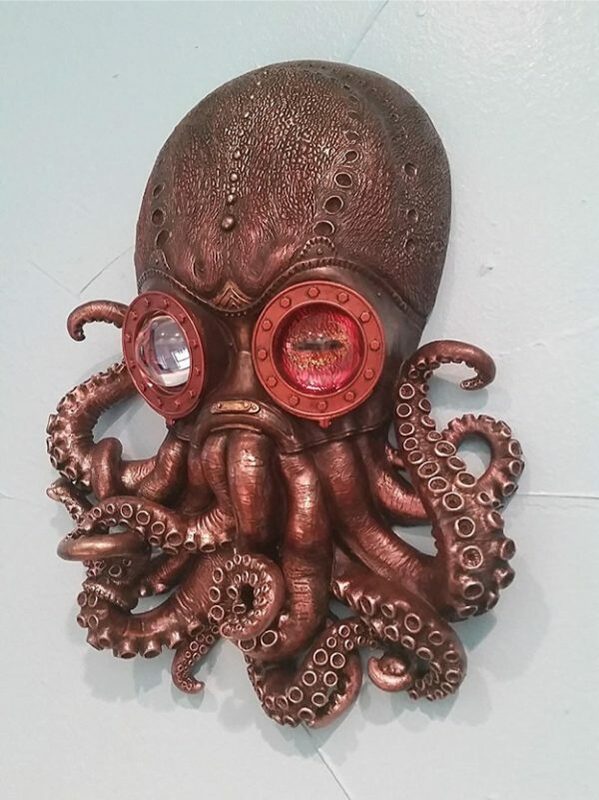 Octopus Clock: Know someone fascinated with Twenty Thousand Leagues Under the Sea? 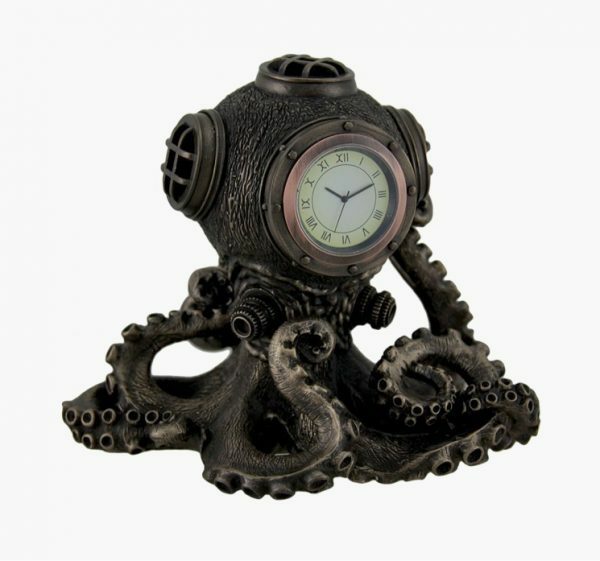 This octopus clock couldn’t be closer to fantasy, presenting an unusual way to wake up to your bedside table. 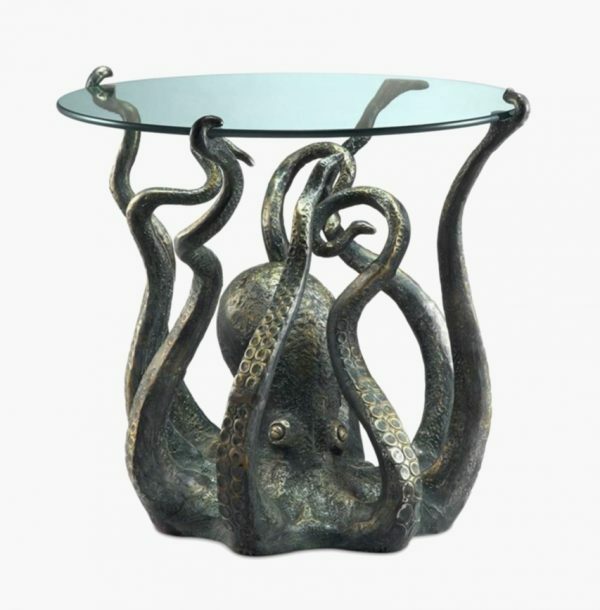 Octopus End Table: Octopi hide under the strangest things. Marvel and delight with this metal and glass creation, perfect for a conservatory or beach-themed holiday home. For more cool end table options do check out our post on unique end tables. 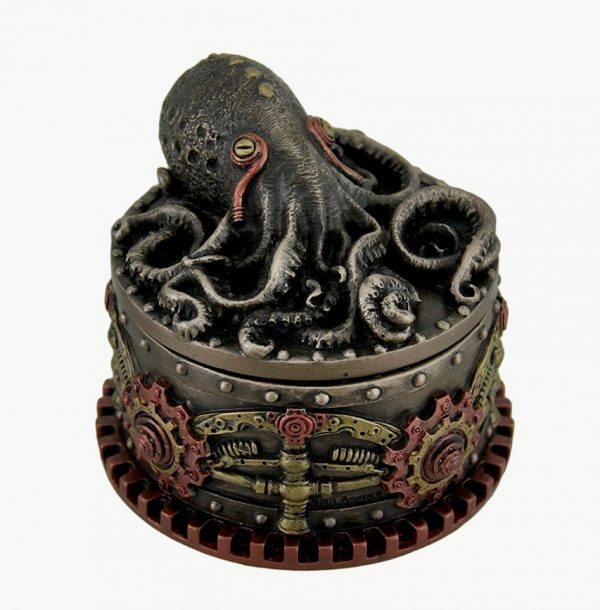 Octopus Trinket Box: For the hard-to-buy-for friend, consider a detailed trinket box. Closely guarded by our metal-detailed creature, all jewellery looks ornate in here. Octopus Paper Weight: For the writers and book fanatics among us, nothing annoys more than floating paper. 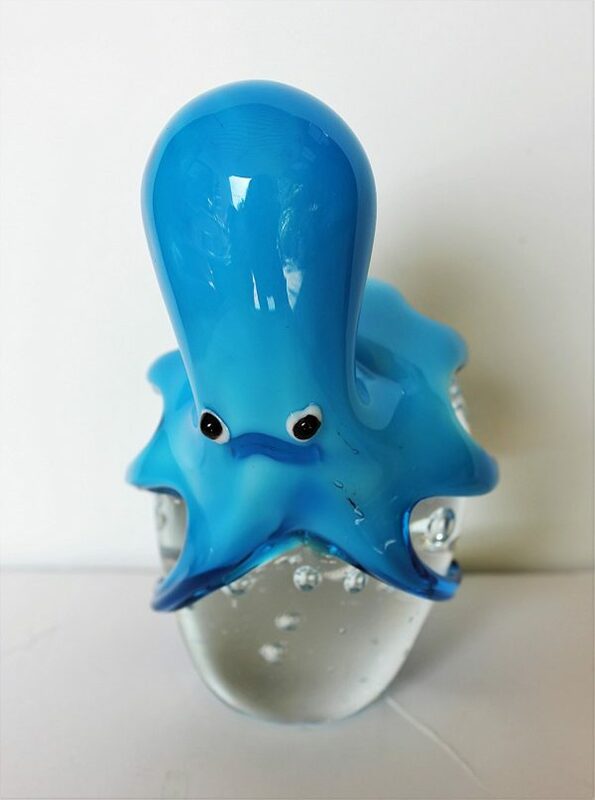 Hold documents under the sea with this bright blue character, complete with glass-look egg. 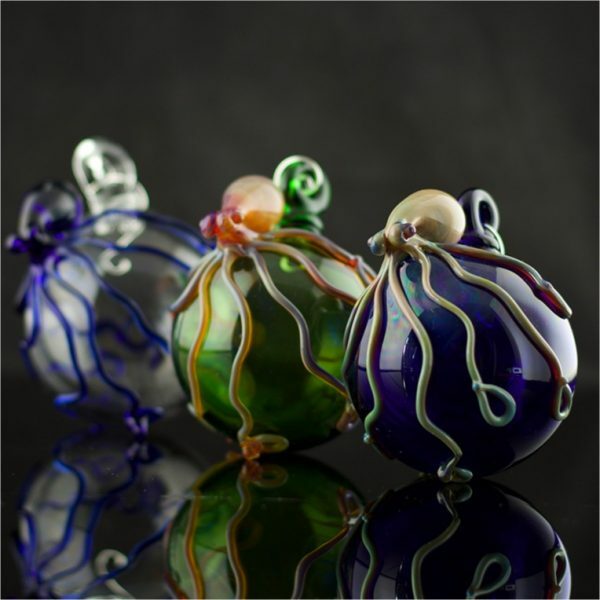 Octopus Hand-Blown Ornament: For a real glass look, try these hand-blown glass ornaments. Could you imagine these on your Christmas tree? 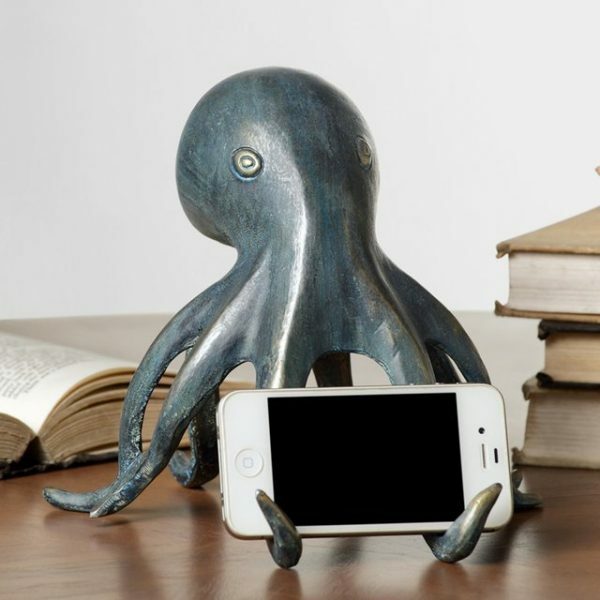 Octopus Mobile Holder with Bluetooth Speaker: For sea creatures both beautiful and functional, look no further than this octopus mobile holder. Hiding a Bluetooth speaker behind its tentacles, it brings an aspect of art to modern technology. Antique Octopus Pen Holder: Some people have all the best things. Be one of the chosen few with this antique pen holder, perfect for writing on those memorable occasions. 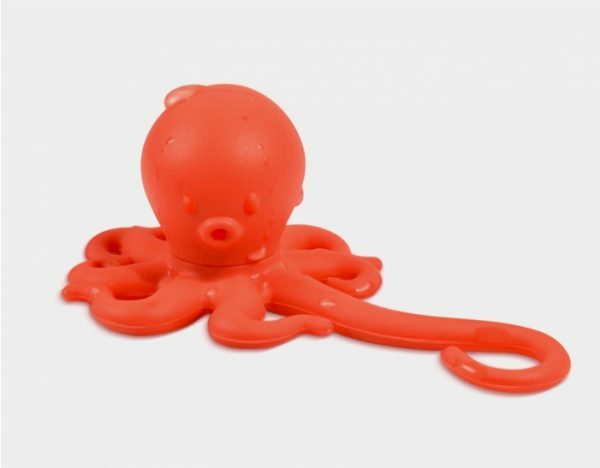 Octopus USB Humidifier and Pen Stand: Three gadgets for the price of one, let this USB humidifier, pen stand and office ornament decorate your working space. 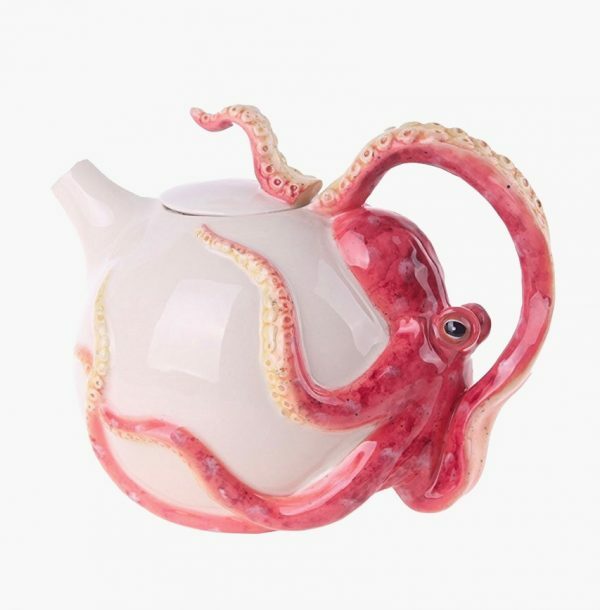 Octopus Tea Pot: Sit down to an underwater theme with this octopus tea pot, perfect for brewing up a storm. 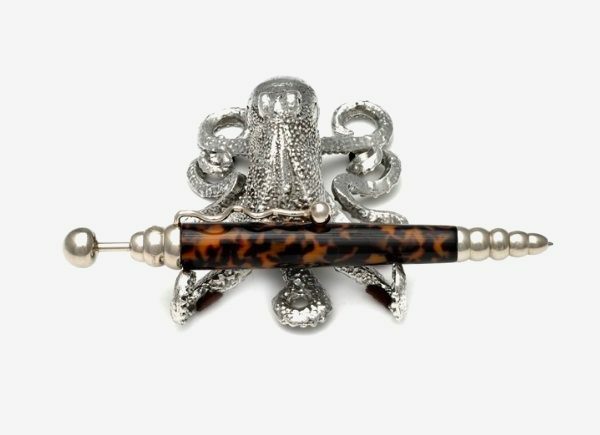 With a coral octopus guarding the handle, don’t be alarmed at its steely gaze. If you are interested in cool looking teapots like this, do check out our post: 40 Unique Teapots to Help You Savour The Taste Of Tea. 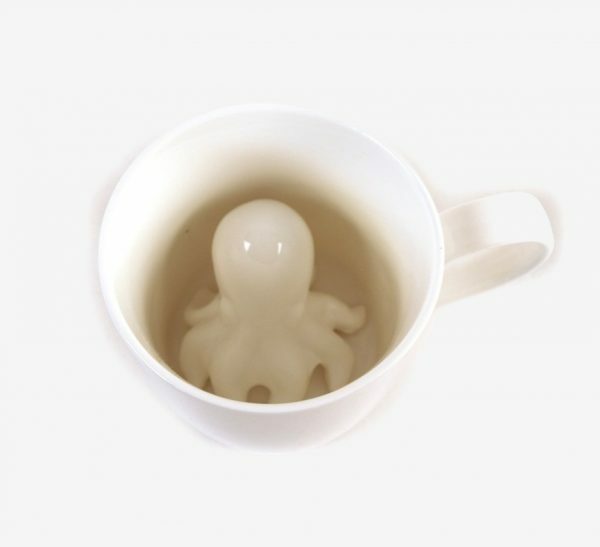 Octopus Tea Infuser: Add to your tea collection with a fellow underwater friend. Hard to miss in bright orange, his tentacles hide diffusing tea. Octopus Shot Glass: Planning on holding an Under-the-Sea themed party? Get out the big guns with these octopus shot glasses, resplendent with natural-looking glass octopi. Octopus Shot Glass Set and Holder: For an underwater banquet, this shot glass set and four-piece holder is hard to miss. Gold with clear glasses, it works with any home décor. 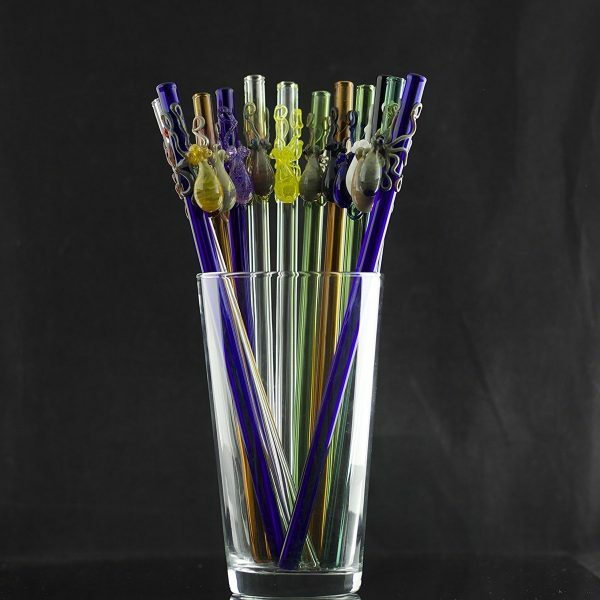 Octopus Glass Straws: Extend octopi to other drinks with this set of multi-coloured glass straws. A touch of elegance, keep them away from the kids. Surprise Octopus Mug: Surprise! An octopus is in your coffee. Start your day with this unique and interesting mug. 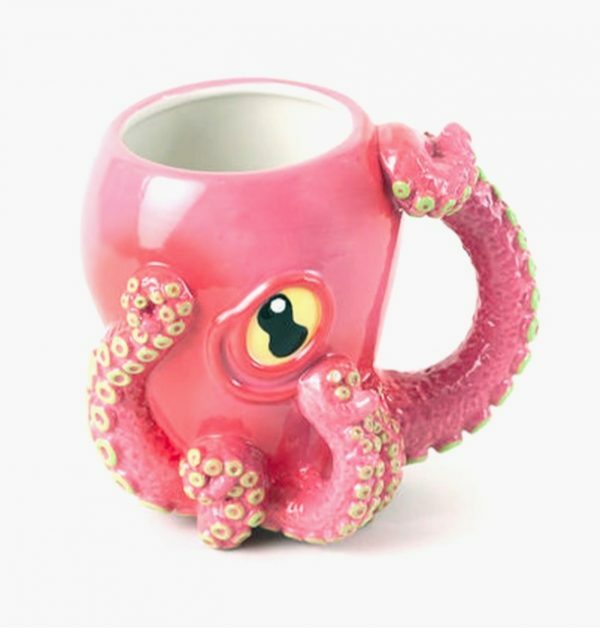 3D Printed Octopus Mug: Marvel at the genius of 3D printing with this colourful mug. Bright pink with impressive detailing, there’s no guessing which cup is yours. Octopus Absorbant Coasters: Tired of coffee spilling over your coaster and onto the table? Remedy the problem with this absorbant octopus design. 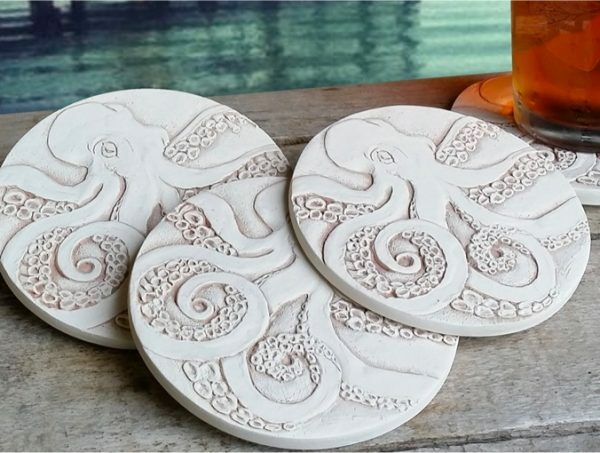 Octopus Stoneware Coasters: Turn style up a notch with these elegant stoneware coasters. Subtle in their detailing, the octopus reveals itself after each cup. 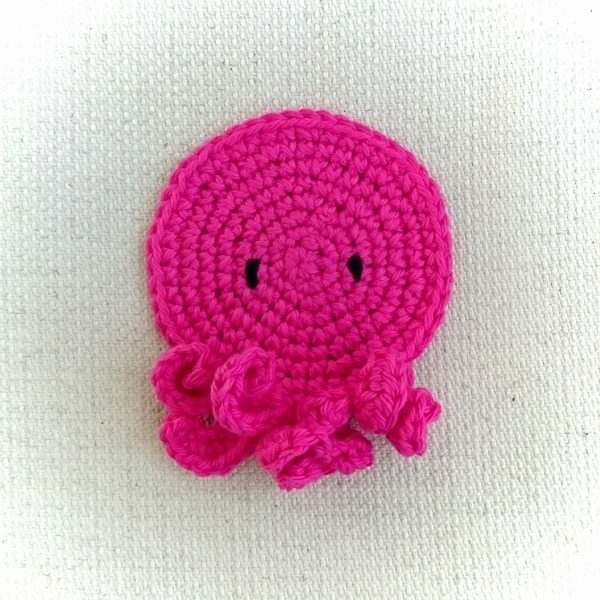 Octopus Crochet Coasters: Get crafty with this cute and colourful crochet design. Perfect for the kitchen table, the kids will love them too. Jump right over if you are into unique coasters. 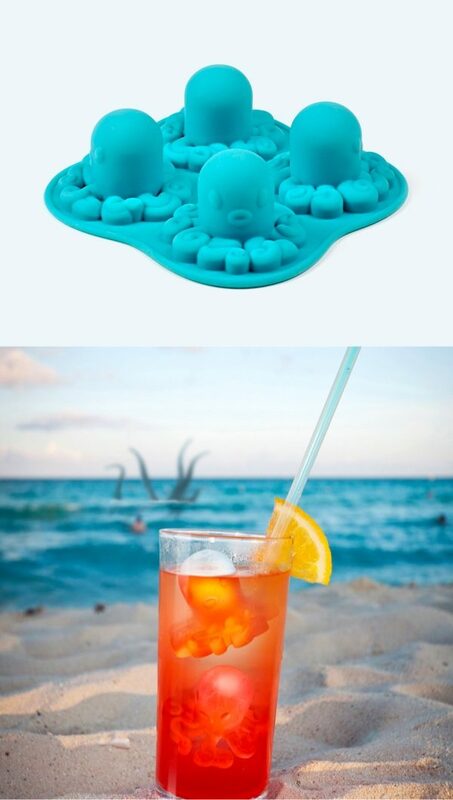 Octopus Ice Tray: Spice up after-work drinks with octopus-shaped ice cubes. With sea animals floating in your drink, imagine yourself on a hot beach. 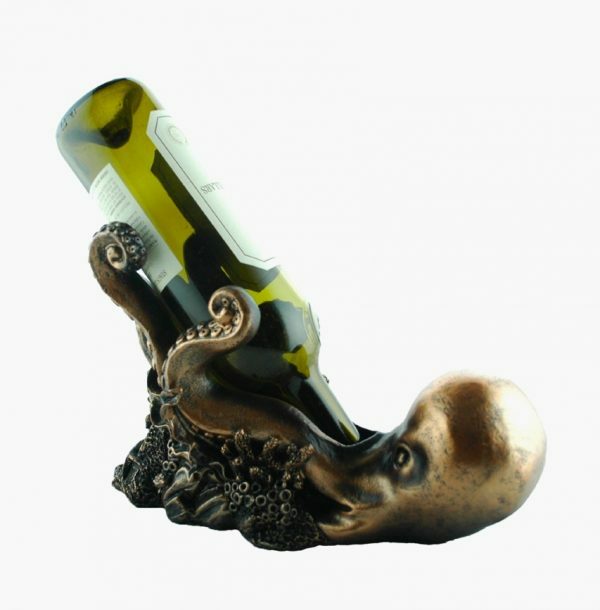 Octopus Wine Holder: Wine and octopus go scandalously well together. Celebrate their pairing with this bronzed wine holder beauty, ready to imbibe the whole bottle. 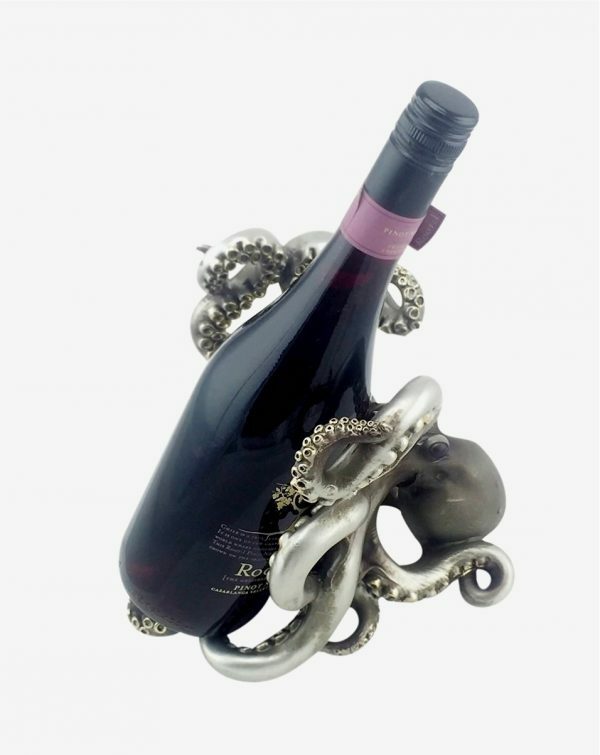 Yet Another Octopus-Shaped Wine Holder: Perhaps the most unique of the unique wine holders, this silver specimen will be the first to get hold of your crisp white. Octopus Wall Sculpture: Octopi are famous for their attachments. Go for a shade of purple with this wall sculpture, a handy piece for your bathroom wall. 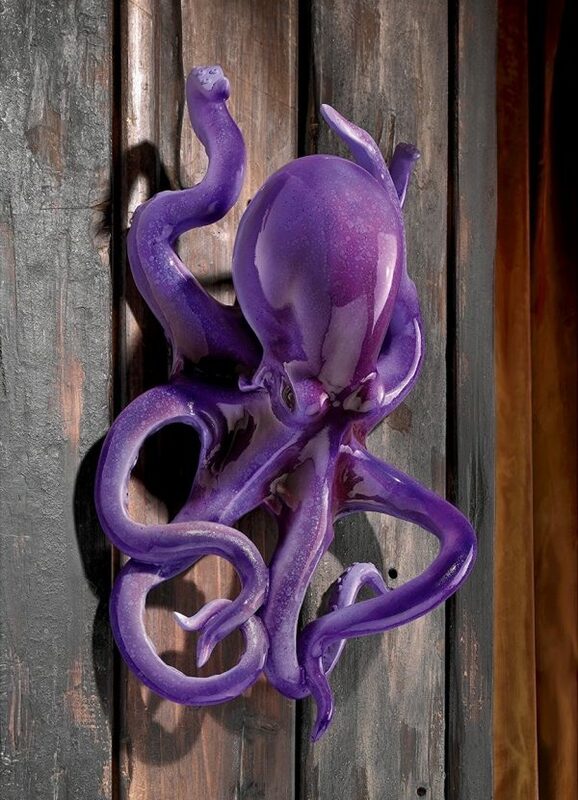 Octopus Metal Wall Art: Purple not your colour? 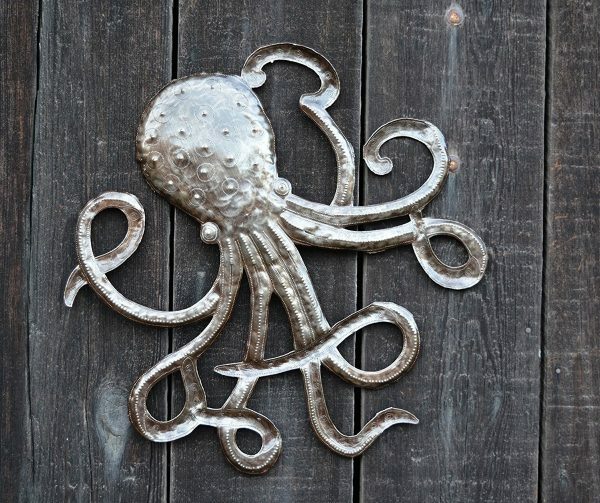 Evoke the sea with this metallic creature nestled above your bathtub. 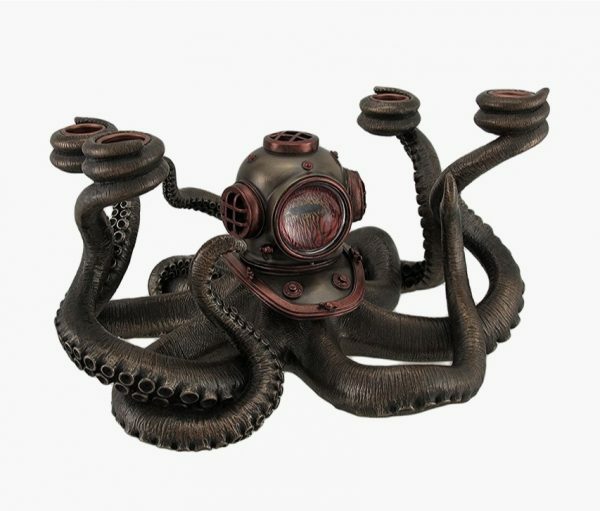 Steampunk Octopus Metal Wall Sculpture: Proud owners of the steampunk candle holder will be delighted to find a matching wall sculpture. Turn the clock back 100 years with this brown-and-bronze creation. 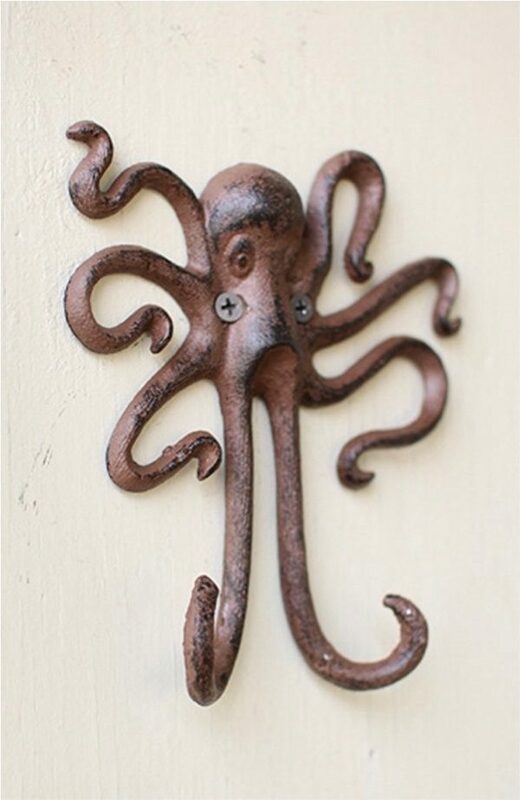 Octopus Cast Iron Wall Hooks: After a funky way to hang your towel? Octopi are an option with this handy cast-iron hook. Do check out our post on more decorative wall hooks. 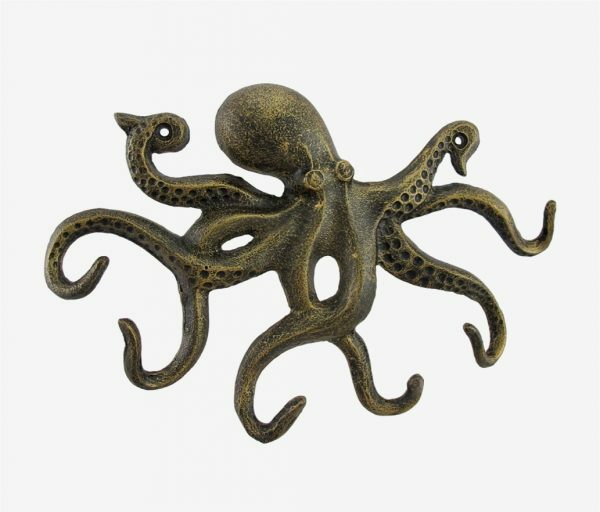 Octopus Bronze Finish Wall Hook: Octopi cater to larger families, too. Get a few towels on the wall with this bronze beauty. 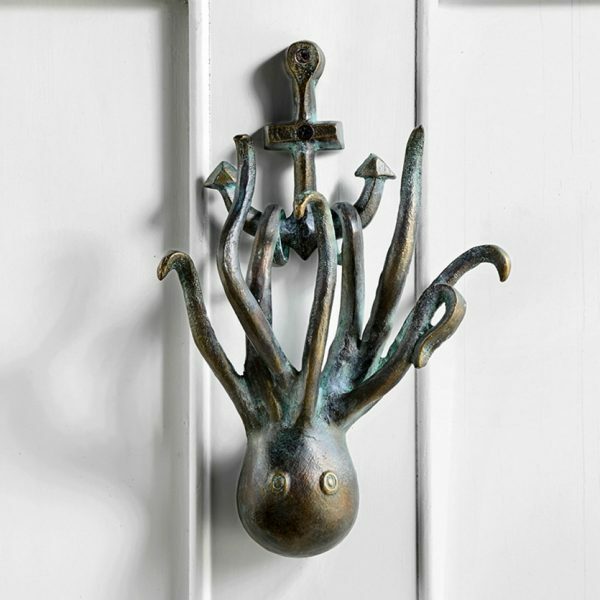 Octopus Door Knocker: Give guests a Halloween-worthy fright when they knock at your door, with this staring octopi. 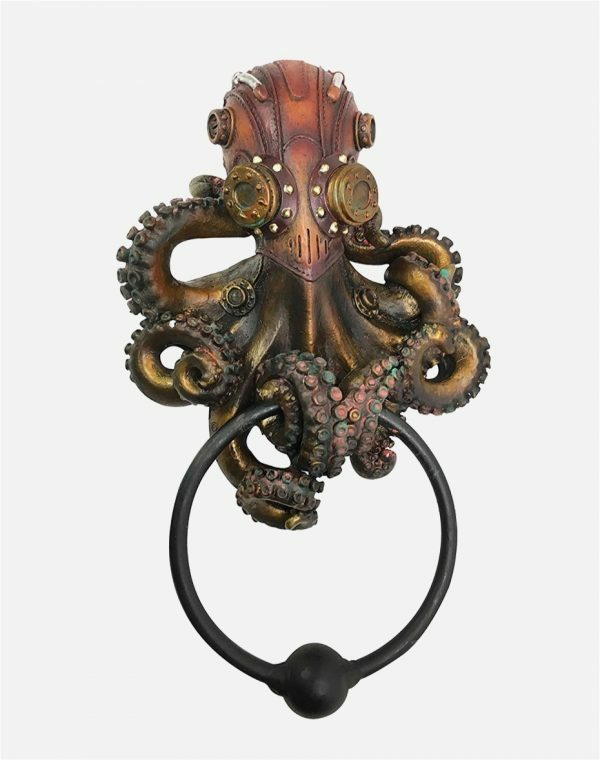 Steampunk-Style Octopus Door Knocker: Part of the candleholder and wall art set, this steampunk knocker will have visitors pulling up their braces. 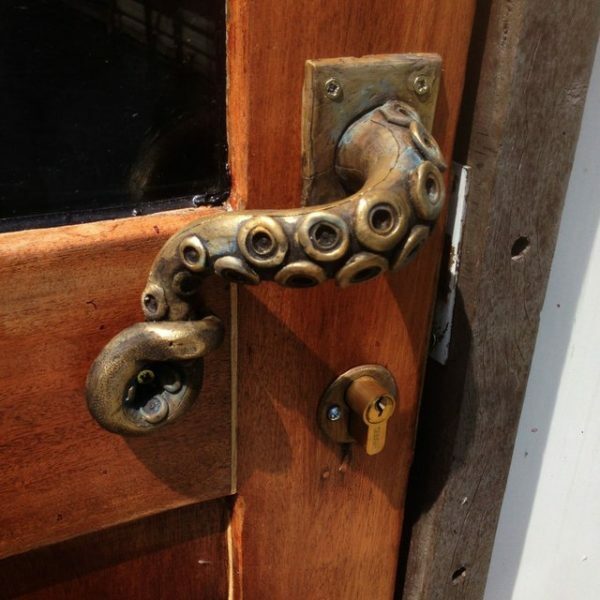 Octopus Door Handle: Add texture to your door handle with an octopus tentacle. Detailed in a bronze look, a dark or mid-wooden door would be a perfect fit. 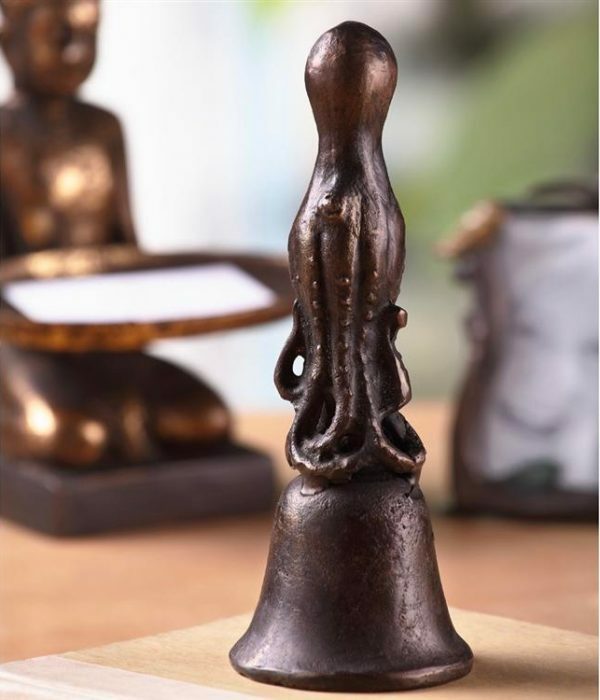 Octopus Hand Bell: At your service! This hand bell can bring seafood to your table – with a minion to deliver it. 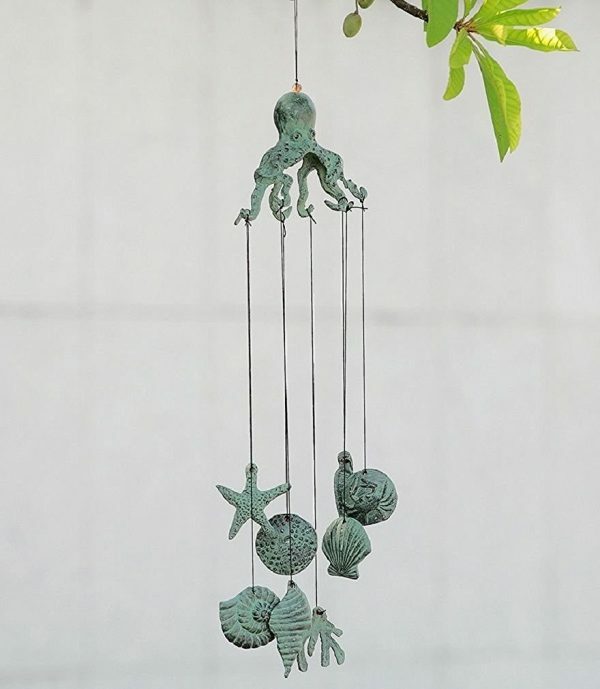 Octopus Wind Chime (Distressed Look): Get that real sea feel with this distressed wind chime, looking truly lost at sea. Golden Octopus Wind Chime: Tell the tale of octopi to your children, with this golden-wind chime singing in the wind. 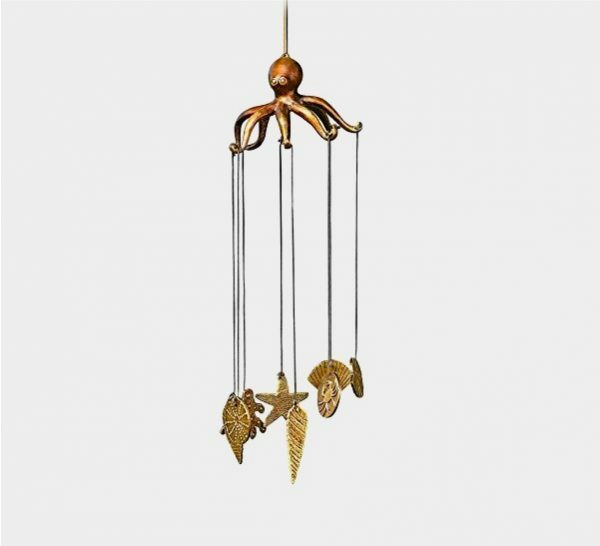 Chic Octopus Chandelier: Who knew octopi could be art deco? 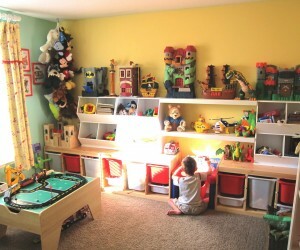 This yellow fantasy would brighten up any kid’s room. 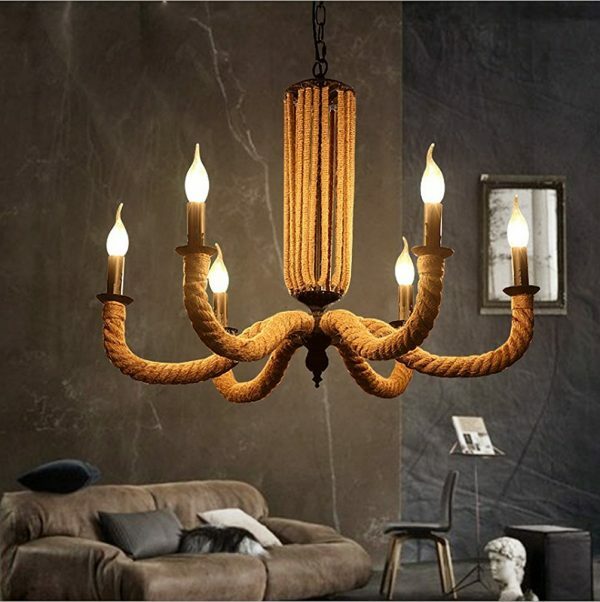 Octopus Rope Chandelier: For just a hint of the octopus, try this coastal chandelier. Mimicking its shape only, no beady eyes will greet you here. 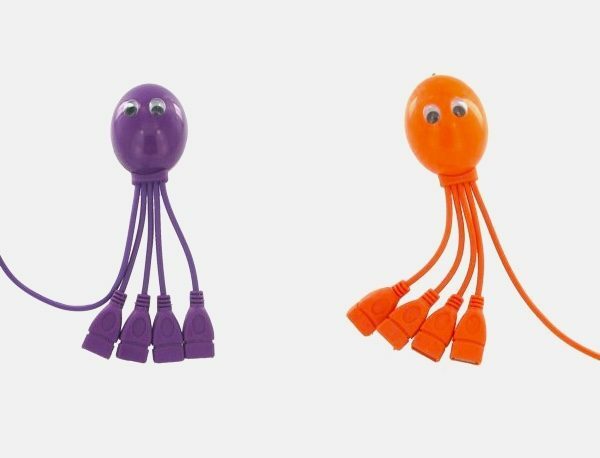 Octopus-Themed USB Hub: More quadropus than octopus, this USB hub lets you charge all your devices in one cute package. Octopus Shower Curtains: Ever wondered about the secret lives of octopi? Wonder no more with these shower curtains, resplendent in a wide range of octopi emotions. Octopus Pillows: Showing off their latest dance moves, these octopi could move well on your bed or sofa. 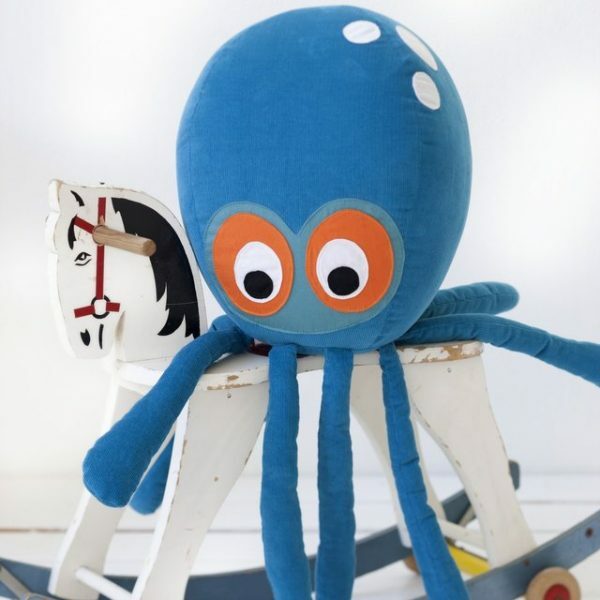 Octopus-Shaped Cushion: One for the kids, this anime-looking character will brighten up any childhood day. Octopus Wall Decal: Want flowing tentacles to flow between rooms? Liven up your wallpaper with these wall decal designs. 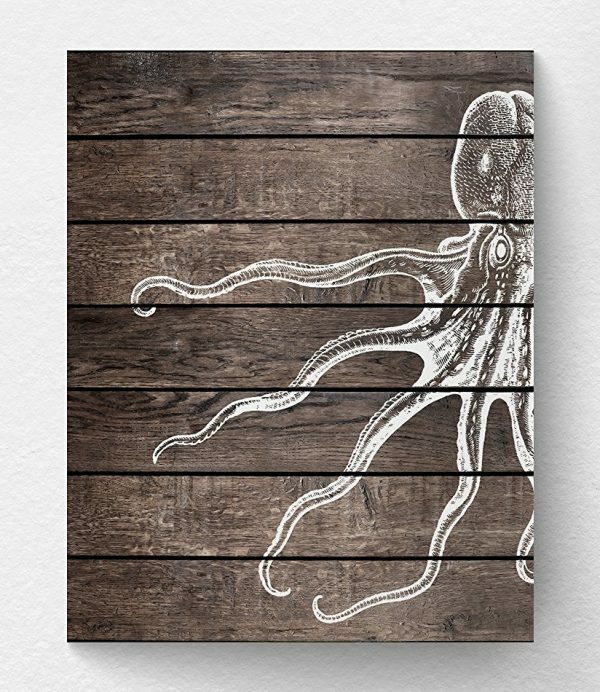 Octopus Wall Art: A less dominating design lies in this wood-look octopus wall art piece, perfect for bathrooms. 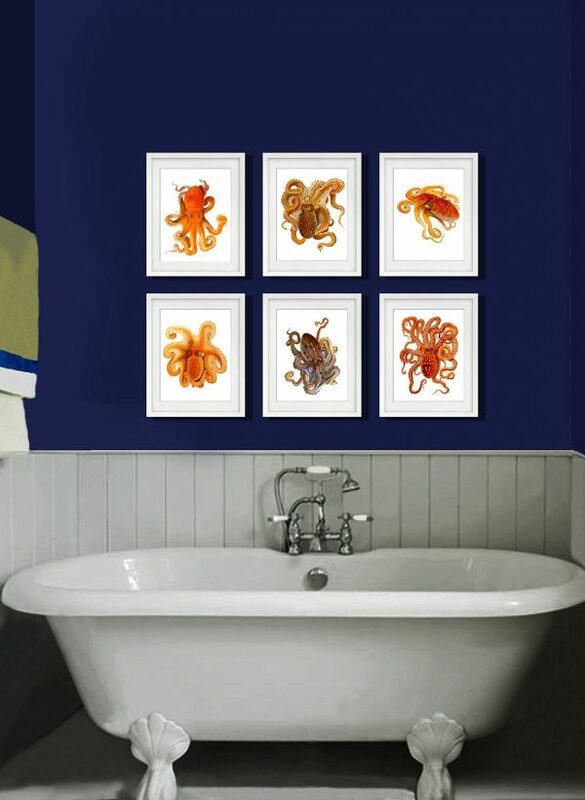 Octopus Art Prints: See the many sides of an octopus with these wall art prints.